I’ve been reading the different opinions on SAFe & the associated training, so it was great to finally get the opportunity to experience the training & content firsthand. It feels as though the framework taking all the best parts of Agile & Lean under a single umbrella will make the best framework. Subjective (often uncalibrated) opinions/estimations of a development process are used to guide the progress of the programme. On the surface, SAFe is a collection of ideas, methods & processes which provide real value to product development so I can see why the idea of bringing them together under one easily accessible framework is appealing. The problem is, just because you pick all the shiny things, doesn’t mean you’ll get the bestest thing. The course was also great for introducing me to different solutions to problems I haven’t come across in previous roles, for example, Product Portfolio Management (PPM). Fortunately, I am familiar with a large bulk of the material that was presented in the 2 days. I was thankful for this as there wasn’t much time to dig into the material in any depth. Now I’m kind of OK with this on training courses – introduce me to new ideas in the course & I’ll go & explore them more deeply on my own time. Woah! Let’s put the brakes on for a minute. The 2nd problem I have is that it feels as though SAFe is striving to be the best framework by pulling all the good stuff from Agile & Lean principles. In the talk, Russ describes taking all the best parts of cars from various manufacturers (e.g. engine from Rolls Royce, transmission from Mercedes) until you have all the parts needed for a functioning car. Now you have a car with all the best parts in the industry, you get the best car on the market, right? Wrong. You don’t even get a car as the parts. Don’t. Fit. The performance of the system depends on how the parts fit, not how they act independently of each other. 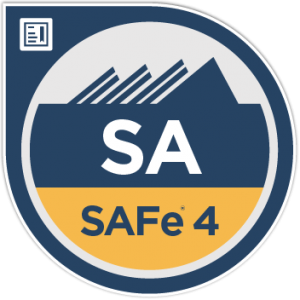 SAFe is essentially a curated list of Agile & Lean ideas combined in a single framework. This doesn’t make it the best & in some cases causes (unnecessary?) tension – for example guesstimates at a team level being used as predictors for progress at a programme level. A good course if you have solid Scrum experience & are willing to continue learning about the course content after you have completed the course. I am glad to have acquired knowledge & routes to further learning in those areas I am less comfortable with (hypothesis 1). 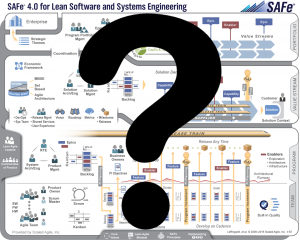 In my opinion, a 2-day course isn’t long enough to provide confidence for those passing the exam being able to coordinate development across multiple teams & lead a Lean-Agile transformation. I also disagree that you don’t need to resit the exam to renew – you just need to pay money. I’d assumed that the content may have been updated, or your understanding of the content may need to be retested. This appears to only be the case if you want certification in a newer version of the framework. Next PostNext SAFe Systems Thinking?